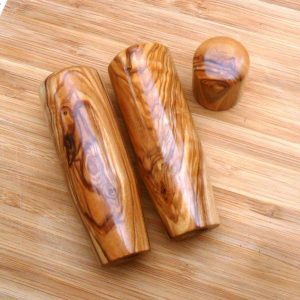 Handmade Elektra Hardwood Coffee Parts. 100% Australian hand made from native hardwood’s. We do not use any type of modern copy equipment. Instead all of our coffee parts are traditionally hand turned individually in small batches at our Perth workshop in Western Australia. This hand-made parts set is for the Elektra Micro Casa Lever espresso machine. Each part is individually handmade using traditional workmanship. The set consists of 2 x steam / hot water valves, 1 x small brewing lever handle and 1 x portafilter handle.